Buying your first designer handbag can be both a blessing and a challenge. This Chloé Faye is my first ever designer handbag. I truly feel like the luckiest girl in the world. Designer bags are quite the investment, but as a lover of high fashion I was destined to get one eventually. I struggled with what brand I wanted, what price I could afford, and what color I should choose. I also have another exciting announcement: my husband is home from deployment! We are both very happy to be together again and we spent a lot of quality time together over the past week. I am SO lucky to have such an amazing husband who loves and supports me in every way. Last week he bought me a belated anniversary present – my first designer handbag. Our anniversary was in March and it took me quite a few months to pick out what bag I wanted, why I wanted it, and on top of that I had to justify to myself why I should even get one in the first place. I wanted to share my experience with you all so you can have an easier time buying a designer handbag. There are so many things to consider before buying your first designer handbag, and I have broken it all down into 8 straightforward tips. These tips are ranked in order of importance! 1. Price – This is by far the most important factor to consider when buying your first designer handbag. My price range was about $1,000-$1,500 and the Chloé Faye Small sits right at $1,390. I wanted a new purse because it was my first, but there are much cheaper options such as buying used. Make sure the bag you choose fits your lifestyle. There is no reason to put yourself in debt over designer items. I really suggest saving up for a designer bag. You can even ask family members to pitch in together for a holiday or birthday present. As mentioned before, buying used is a great and cheaper alternative. I found a used Chloé Faye for less than $700! 2. Functionality – Is your designer handbag going to be a work bag, going out bag, travel bag or everyday bag? These are important things to consider before purchasing your first designer handbag. I am using my Chloé Faye Small as an everyday bag. It is perfect for a day of shopping or traveling around a new place. If I were to use it as a work bag or needed more space for my things I would have opted for a larger bag. As you can tell this bag doesn’t fit much, but it is the perfect size for me as a day purse. 3. Quality – Different price points offer different features. For example a $500 bag may be factory made, while a $1500 bag may be handmade, painted or constructed. Make sure you read the product description and look for factors such as materials and where the bag was made. For example, my Chloé Faye Small was made in Spain. I would see some red flags if it were made in Bangladesh or China. If you are paying high prices for luxury goods you need to ensure that your bag is not only made in upstanding countries when it comes to fashion production, but also made from luxury materials. 4. Silhouettes & Size – As mentioned before, size is an important factor when buying your first designer handbag. Perhaps you want a tote to carry all of your belongings or you may want a clutch for a night out. There are quite literally hundreds of options, and there is the perfect bag for any occasion in any style. Another factor that plays in is the silhouette. Many high fashion houses have famed themselves on the silhouettes of bags. As a fashion freak I can easily tell which designer made it by the shape of the bag and its aesthetic. The shape speaks the brand. Make sure the silhouette not only matches your style, but it’s also a brand you want to align yourself with. 5. Colors – This was by far the most difficult thing for me when purchasing my bag. It was a good thing that I waited and really slept on it. I had my eye on this Chloé Faye Small in Cement Pink for about 5 months. I was wondering if I would be able to wear the bag in the fall and winter, and then again in the spring and summer. Before buying your first designer handbag you need to consider if you are looking for a year round color or seasonal shades. These will both play into how often you actually use the purse. 6. It-Bag – Over the past decade there have been designer bags that have set themselves apart from the others. To name some it-bags off the top of my head, the Céline Luggage Tote, Gucci Dionysus, and the Chanel Boy Bag. Now buying what’s new and trendy is always sooo tempting, but as an investment piece it’s important to consider the longevity of the style of the bag. It may be fun to opt for the funky color or print, but will the bag go out of style? Try looking past the most sought-after bag of the season and aim for a more practical designer handbag that will last you a lifetime of style. 7. Pick a Brand – There are so many designer houses to choose from. From European classics like Gucci, Chloé, Saint Laurent, Fendi, Louis Vuitton, or cult-favorite Asian brands such as Comme des Garçons or Issey Miyake, no matter what your style is there is a fashion house that matches your aesthetic. Picking a brand may also be really difficult, but if you consider the tips above, narrowing down your selection will be a lot easier! 8. Where to Buy – Just like the tip above, there are hundreds of places to shop. You can buy in-store or you can shop at multiple online boutiques. I purchased my Chloé Faye at Forward by Elyse Walker because I thought the colors and description on the website were the best representation of the bag. I have made a list of place where you can shop online for designer handbags, besides purchasing the bag from the brand’s store or website. While there is no huge difference between purchasing from a boutique v.s. the brand, you could potentially rack up purchasing points if using a Nordstrom credit card and buying your bag from there, or alternatively you will get more brand-related packaging such as a box if you purchase directly through the brand. I hope these tips help you while buying your first designer handbag. I wanted to make this resource because designer handbags really are an investment, but if you plan and act accordingly they will last you a lifetime. If you need additional help when purchasing a handbag, check out my new Personal Shopper Service! I can help you choose the right bag, or outfit for any occasion. Previous PostPrevious Simply. Sophisticated. Summer. All such great tips and I absolutely adore your choice! Its the perfect color for all seasons! Love this post! I feel so lost when thinking about investment bags….this is super helpful! Such a helpful post! 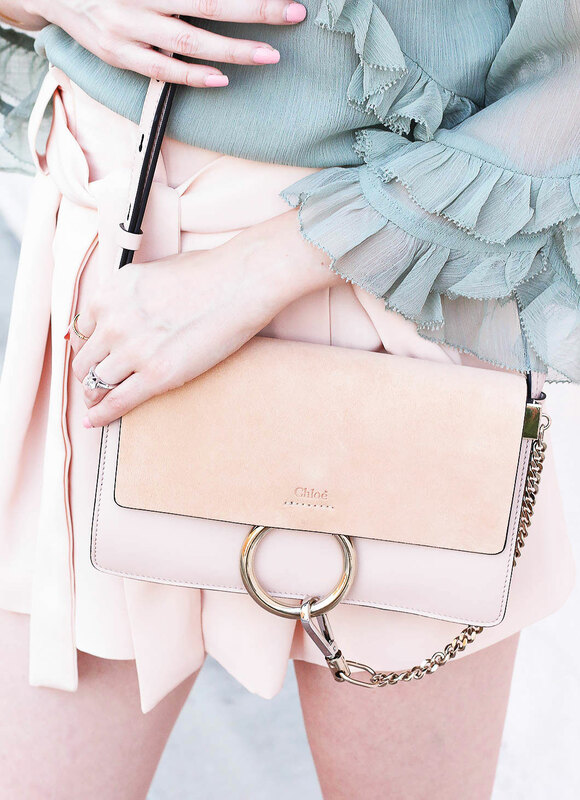 The Chloe Faye bag is absolutely beautiful and I love how you styled it here. Also loving this entire color combo, those neutrals paired with the light green and pops of pink is perfect! Ahhh I have been wanting this bag but I’m indecisive. This post came at the right time! Now this look is so pretty, so me! 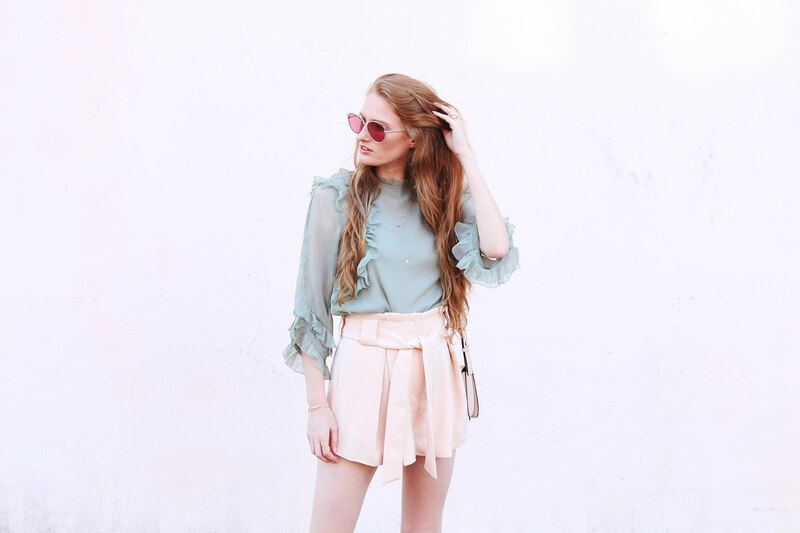 I need that blouse! That bag is GORGEOUS and holy smokes you’re beautiful!! Great post! I love this post!! SO many great tips that i definitely think will help people out!! These are great tips!! Definitely helpful since it is quite the investment! Beautiful bag and styling. Very well thought-out; love your advice! This is a great post, I love the tips that you’ve given. It’s really an investment because of the quality of material it’s made with it will last a long time, with proper care. 1: Pastel colours are stunning on you! 2: Fantistic tips! I can’t wait to apply them. 3: IM SO GLAD SCOTT IS FINALLY HOME!!!! your chloe bag is absolutely beautiful! i love the color! you styled it perfectly and these tips are really great and fun to read. These are all great tips! I wish I knew all this when I bought my first designer bag. Great tips! I loved them all and have found many to be helpful as I purchase handbags! These are such great tips! That bag is AMAZING! I think this bag was an excellent option. It’s stunning, the perfect size, neutral (so it matches everything), and was the best price for you! I still have yet to own a designer bag, but Chloé, Celine, and Chanel are my top three picks! I love this blush color! So cute and it makes the perfect fall transition outfit 🙂 I’m so glad you wrote this post because I’ve been looking to get my first designer bag also, but never considered a few of these things. I’ll definitely have to do my designer research and this post was such a great resource. Cheers, love! Great tips! I am so glad you shared this because I have been thinking about a designer bag for a while and haven’t gotten up the guts to pull the trigger! These are great tips! I bought a gently used Louis as my first designer handbag and it definitely taught me a lot about how to shop new. This summer, I got my new Louis from the store and knew how to pick it out! such great tips! i wish i knew these when i first purchased my designer handbag! I needed this in my life! So over whelming picking something out you will cherish forever! Your bag is gorgeous! Love these tips, too. There are so many designer bags I’m lusting over, but your tips are going to help me filter some out so I get the right one! This whole look is perfection! I’ve wanted a bag like that for so long. Maybe someday…. Great tips though! LOVE your tips and your pictures are ALWAYS the BEST!!! LOVE your choice – you will get a lot of wear out of this size, shape, and color. Thanks for sharing your tips too! Awesome tips! I’ll be pinning this for the future. I love your bag & totally agree on all of your tips! 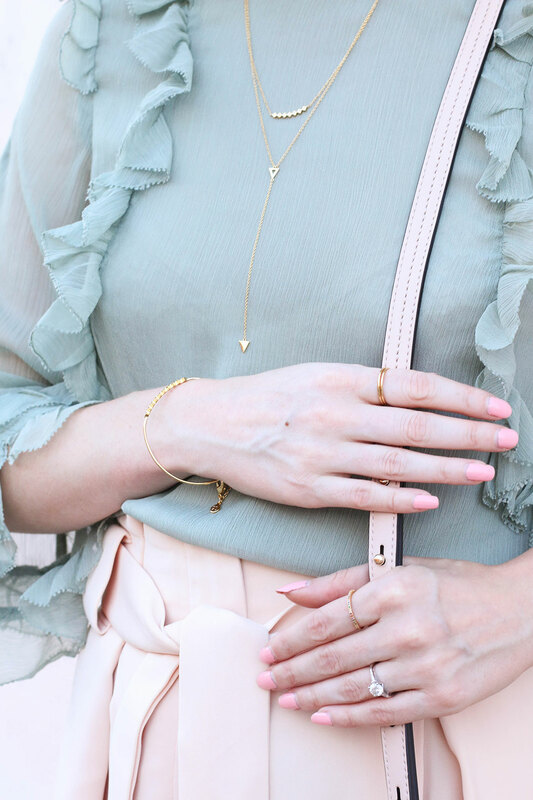 These pastel colors are so pretty paired together! Great tips! Love your bag! And those legs girl – holy smokes you’re gorgeous. Your bag is gorgeous! These are great tips! Book marking this post now! Thanks for this girl! Soo good! OBSESSED with your top! Definitely saving this post! Love all your tips! Your bag is gorgeous and love how you styled it! Welcome home your your hubby! This Chloe bag is absolutely gorgeous!! Yes, I agree, the bag should have enough functionalities to ensure that it offers more space and convenience. 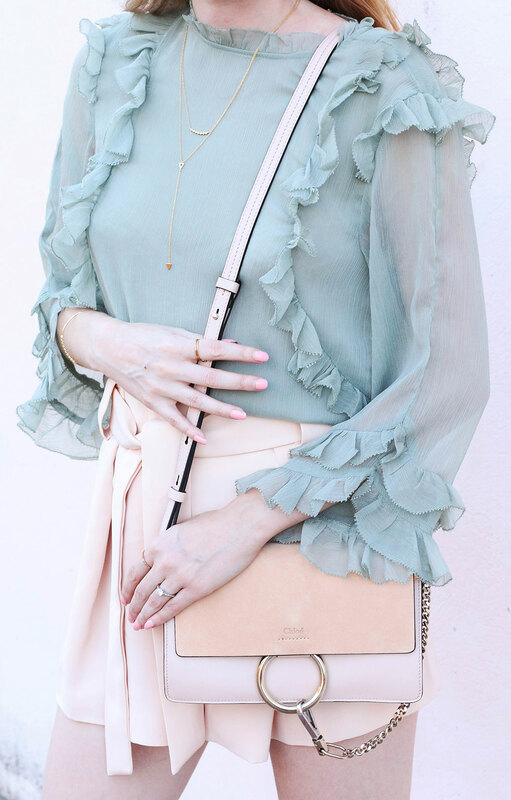 The pictures looks amazing and the hand bag is going perfectly with the outfit. Its a great match with great blog. Thanks to the author for sharing this.